Are you a person who longs to enjoy amenities such as tennis courts, amphitheaters and golf? Want to be just steps from the beach? 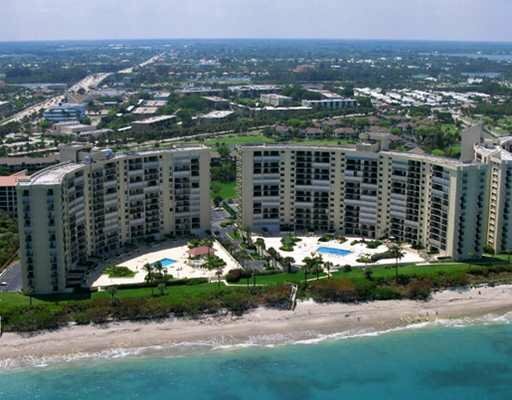 You may want to start your search for a condominium at Ocean Trail in Jupiter, Florida. Real estate development is not permitted directly on the beaches of Jupiter. The first 4 buildings of Ocean Trail are the exception. So when you step out of your condominium you’ll breath in the sweet smell of ocean air and be just steps from the beach. These beautiful buildings are approximately 14 stories high. Equipped with a pool, underground garage, sauna and jacuzzi, Ocean Trail life is luxurious and convenient. The first 4 buildings of Ocean Trail offer two bedroom units and the 5th building also offers larger condos with 3 bedrooms and 1600+ square feet. Exceptional views of the ocean and the Jupiter Inlet. Ocean views from all rooms. Freshly painted and some updating throughout. Easy access to shopping, entertainment, dining, major highways, turnpike and more. This community offers tennis, pickle ball, community pool and building pool, party room, exercise room, sauna, hot tub and much more. Ocean Trail is also sought after by spring training fans. Don't miss out on Florida living at its finest!